Casualty Monitor: Civilian Casualties Continue to Rise in Afghanistan: Are suicide bombers or NATO responsible? Civilian Casualties Continue to Rise in Afghanistan: Are suicide bombers or NATO responsible? According to the Afghanistan Independent Human Rights Commission (AIHRC) over 155 Afghan civilians died in ground military operations, aerial strikes and suicide attacks by Taliban insurgents, US, NATO and Afghan government forces in September alone. Their estimates for the number of civilians killed by Taliban attacks and by coalition military activity are very similar. It should be noted that in previous casualty tallies by the UN, the number of civilians killed by NATO forces has exceeded the numbers killed by the Taliban. What is striking though is the rise in the recorded number of deaths. In July, the UN reported a total of 600 civilian deaths for 2007 to that date, making a monthly average of about 100. Based on that estimate, the total for September has increased by over 50% from the average. 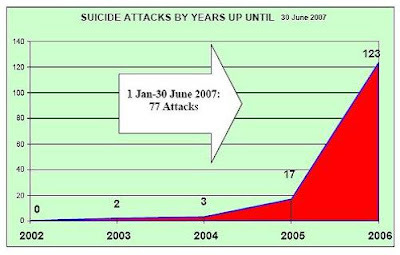 Part of the reason for the apparent rise in civilian casualties during 2007 may be the increased use of suicide bomb attacks. While suicide attacks by themselves are not in violation of international law, and also have the potential to be used as precision weapons for targeting the military, in reality reports suggest that their use in Afghanistan has led to a large proportion of civilian casualties. A UN report (pdf) published last month analysed the use of suicide attacks in detail. Suicide assailants in Afghanistan and their supporters seem to be mobilized by a range of grievances. These include a sense of occupation, anger over civilian casualties, and affronts to their national, family, and personal senses of honour and dignity that are perpetrated in the conduct of counterinsurgency operations. Some attackers are also motivated by religious rewards and duties..."
What is clear from the available data however, is that the increase in suicide attacks cannot, by itself, account for the reported rise in casualties. Half of civilian deaths continue to be caused by pro-Government NATO led forces. It may well be that the use of suicide attacks, in which attackers disguise themselves as civilians (perfidy), makes distinguishing combatants and non-combatants more difficult and increases the risk of 'pre-emptive' shooting. However, the burden remains on all parties to the conflict to take all necessary means to minimise civilian casualties. Not only is it a moral and legal imperative, it also make essential strategic sense. As the UN report on suicide attacks comments on the NATO effort. "Immediate efforts are needed to diminish perceptions of a foreign military occupation: all forces engaged in counter insurgency operations must reduce civilian casualties and conscientiously work to uphold the dignity and honour of Afghans, to avoid provoking outrage in the population and a ready supply of volunteers for jihad"